So I was a little overjoyed when I found out that Lowe’s sold brick Masonite textured sheets at 25 bucks a pop. I wanted the bricks to look like they had that the worn white cement in between so I set out outlining the bricks in an off-white/brown/grey mix that I concocted carefully by just adding and mixing on a paper plate. 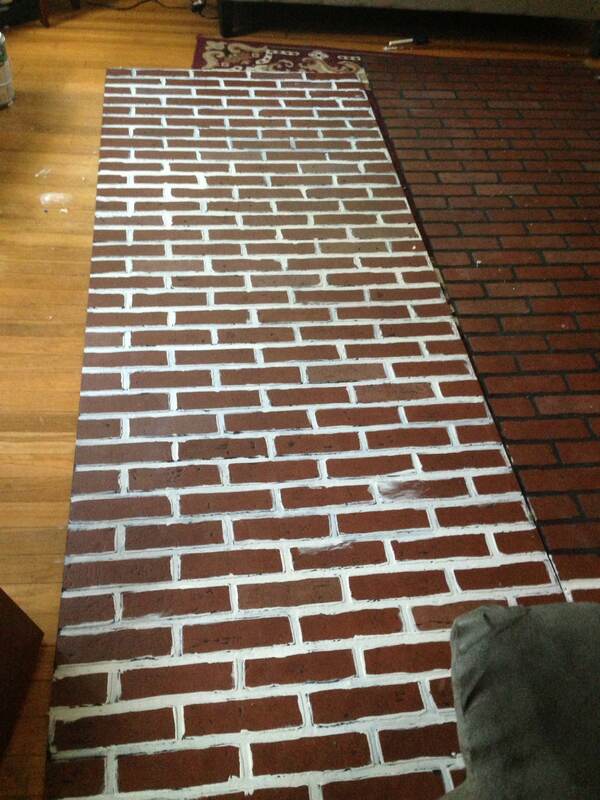 Then I applied it to the gaps between the bricks with a foam brush and sometimes a small paint brush. I didn’t mind if some lines were bigger than others because it looks way more natural and less processed that way. I let that dry, which didn’t take long in a very air conditioned apartment. 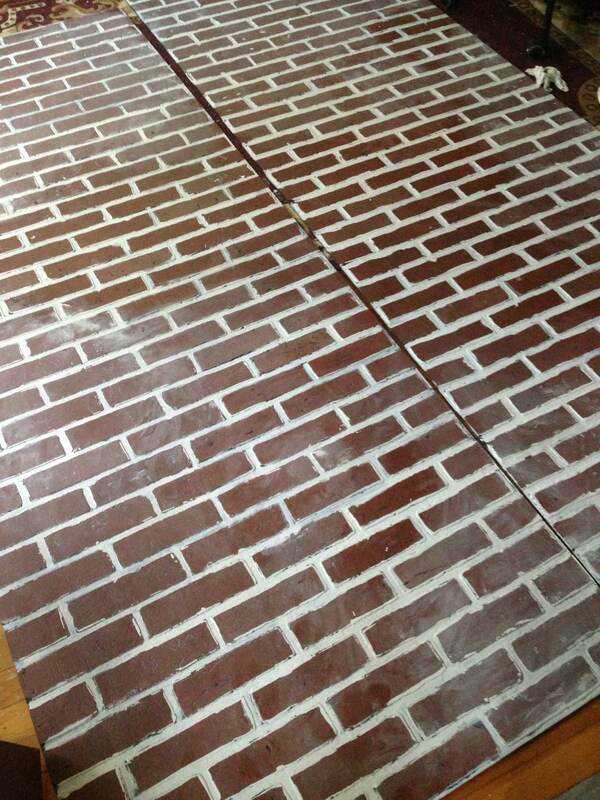 Then I went on to making the bricks look old. Listen, there are a lot of tutorials on this out there… And I’ve watched/read a lot of them. But most of the processI learned from scenic painting so I encourage you to look at all the ways before you try this yourself. Most of the tutorials I found made the bricks look too white. 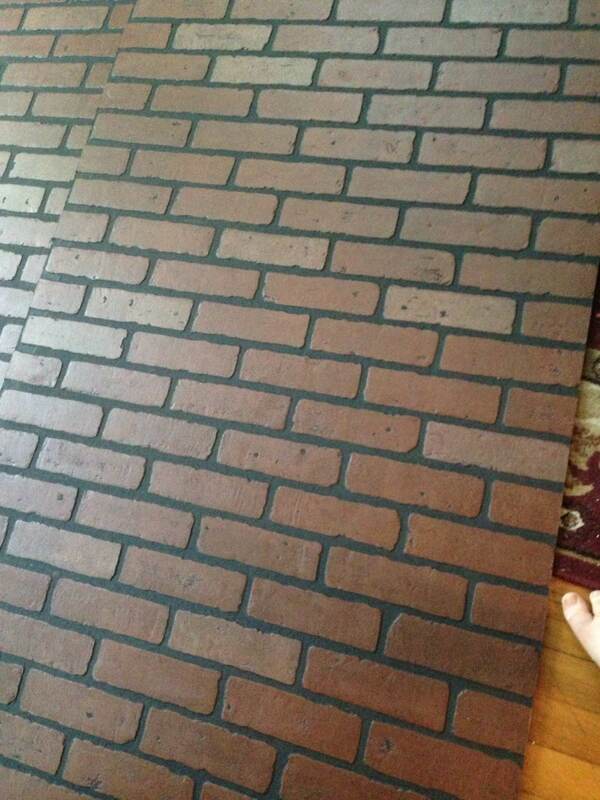 I bought red brick panels because I still wanted some red brick to show through. But some enjoy the white washed brick approach so try em all! Because I had our brick sheets cut down to 3×8 rather than 4 x 8 I had some pieces to try a few techniques out on before moving on to the main pieces for the door. The first technique I tried was with a make your own spray paint mixture in a dollar store travel spray bottle. And then apply it by spraying and moving it around with a plastic bag. It looked ok, but it just wasn’t natural enough. Then I picked up the same mixture I used for the cement in between the bricks and used the foam brush to put on a lot in one place. Then I grabbed the sponge and a spray bottle and put warm water plus a drop of vinegar. 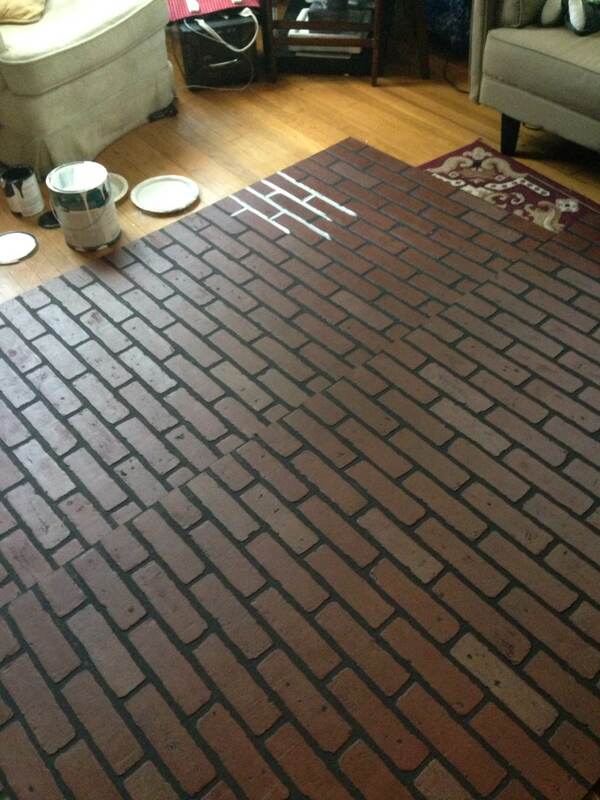 I sprayed the water on my paint mixture and used the sponge to move it pretty far across the bricks. 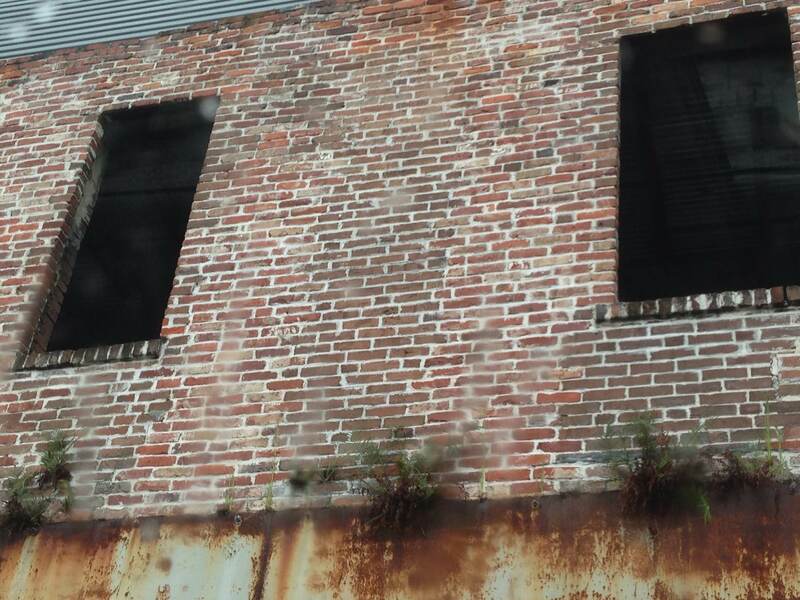 If I wanted more brick to show I’d use a paper towel to wipe excess paint away and show more red brick. I left some areas untouched and some with a lot of white. Also I used my hands. Don’t be afraid to get messy! 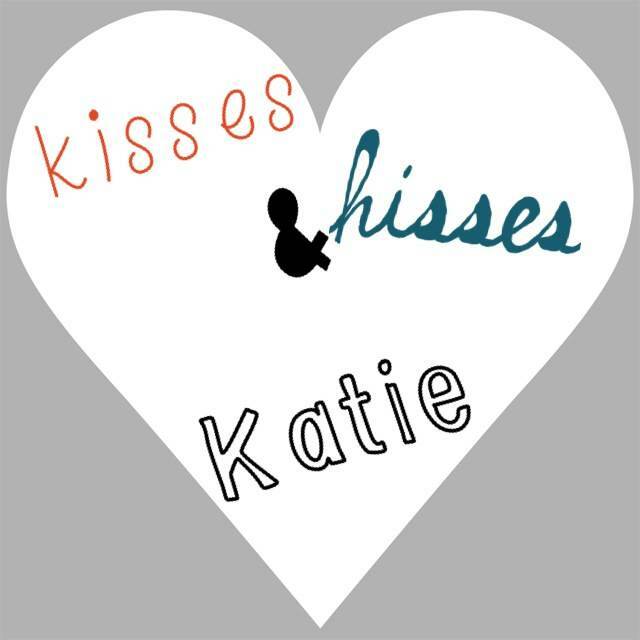 This entry was posted in Projects and tagged Brick, Brush, cobras, Crafts, DIY, Foam, Lowes, Masonite, Materials and Supplies, paint, Projects, Weekend on June 18, 2013 by craftycobras.